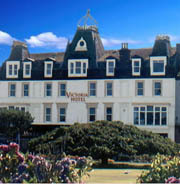 The refurbished Victoria Hotel on the Island of Bute is setting the standard for excellence for hotels in Scotland. A creative and inspirational transformation of what was historically this Scottish islands most prestigious hotel into a facility combining the best of Scottish traditional values with state of the art facilities. Our aim is to make your stay in the Isle Of Bute and Rothesay a truly memorable experience. 20 stylishly appointed en-suite rooms with television, tea/coffee making facilities and Wi-Fi throughout. Enjoy views of The Clyde Coast, Esplanade Gardens, Rothesay Bay and the Cowal hills.